We brought just a little bit of Indiana Street with us to Downers. Over the weekend, we put up our trees inside the house, but we also went to Menards and bought a small 5' Fraser Fir to put up in our front yard. Just like we did on Indiana Street. Starting with our first Christmas in Elmhurst (in our first house), we participated in the tradition of erecting a 'front yard tree' along with our neighbors. My sister Vic told us about the tradition before we moved in and sure enough, we fell in love. The street(s) always looked so great when all of the homes had a uniquely-styled and lighted tree. 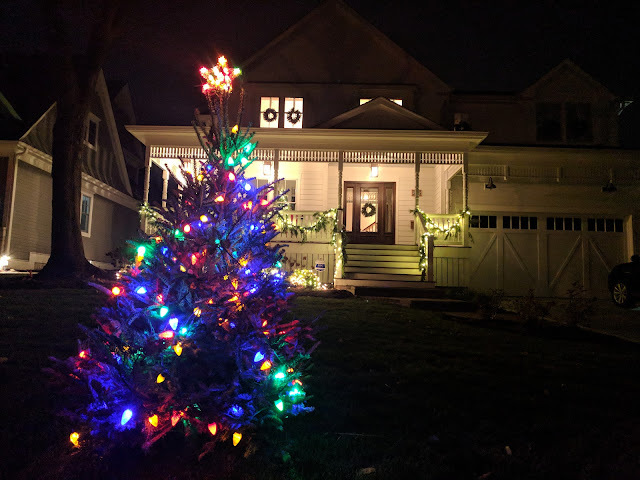 You can see the C7 bulbs I put on our tree this year out in front of our #newoldfarmhouse. Nat did a great job doing 'classy' decorations on the porch with garland and lights. And wreaths in the windows that you can see above. So, while we have moved out of Indiana Street, we still wanted to bring some of that tradition with us in our new digs. So, right now, we're all alone with our front yard tree and I've even gotten a few comments/questions about our tree from neighbors. Yeah..people are asking "What's with the tree in your yard?" Hmmm...this has kind of sparked an idea in my mind. Back in Elmhurst, the local school district runs the front yard tree program as a fundraiser. I think the trees were $20 and we had a 'block captain' who created the flyers, dropped them off at everyone's house, collected the money, coordinated with the school foundation with delivery, hosted everyone out front of their house on the Saturday after Thanksgiving when the trees were dropped off. It is a nice program that brings blocks/neighborhoods together, but also raises a few dollars for charity. We live in the Randall Park neighborhood and from what we've been told, there's an existing Christmas Eve neighborhood tradition that involves neighbors putting out luminaries that line the sidewalks in our 'hood. Sounds awesome. But, I can't help but wonder if there isn't room for another Christmas tradition? Securing a source for the trees that is inexpensive so there can be fundraising and still keep the price point to $20 or under. Figuring out delivery of said trees. Marketing to neighbors and other homeowners to get them to 'buy' a tree with web/social media and flyers door-to-door. Understanding how the charity/fundraising component would work - i.e. which charity? Do we run it under our 'Ice Cream for Breakfast' non-profit? Sponsorships? To underwrite some of the overhead leaving all the donations to flow to the charity? Getting all of that done by Labor Day or so, allowing us to be in the field in October so we can collect the forms by Halloween. Order trees in early November, have them delivered after Thanksgiving. I think I have Nat on board to give it a go. But, we probably need to find a few other like-minded people to join the cause? More to come on this, I bet. I've covered our front yard trees on the blog over the years. Here's the photo and post from 2016 when we were at Vic/Equation Boy/Man's house.